Win the hearts of your close ones by sending this Breathless Luxury Mixed Rose Premium Bouquet and mesmerize them by your sweet gesture. These 12 Mixed Rose Bouquet are wrapped in a beautiful Net. 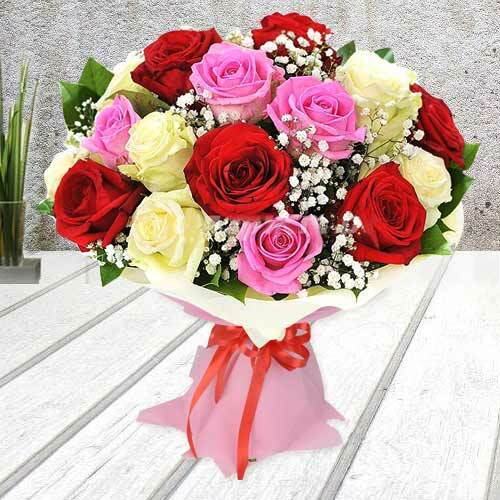 Tighten the bonds of your relationship by ordering online this Jewel-Toned Perfect Combination Mixed Rose Bouquet for your loved ones and give them a reason to love you more. This Bouquet comes with 15 Mixed Roses and to create an impressive statement this Bouquet is wrapped in a beautiful Net. Win the hearts of your close ones by sending this Breathless Luxury Mixed Rose Premium Bouquet and mesmerize them by your sweet gesture. These 20 Mixed Rose Bouquet are wrapped in a beautiful Net. Win the hearts of your close ones by sending this Breathless Luxury Mixed Rose Premium Bouquet and mesmerize them by your sweet gesture. These 30 Mixed Rose Bouquet are wrapped in a beautiful Net.